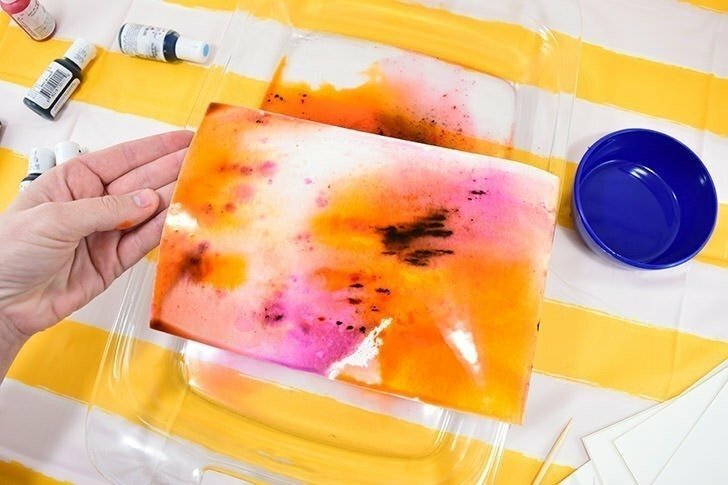 Dig around in the pantry because this fantastic kid’s craft uses food to make amazing abstract DIY art pieces that even adults will want to make! AND my guest room has been an empty shell of a space for a few weeks now, the bed gone and the walls painted a clean, fresh white. The space has made an awesome photography studio for me, but guests, they need a bed, and so it will be changing back to a bedroom soon. 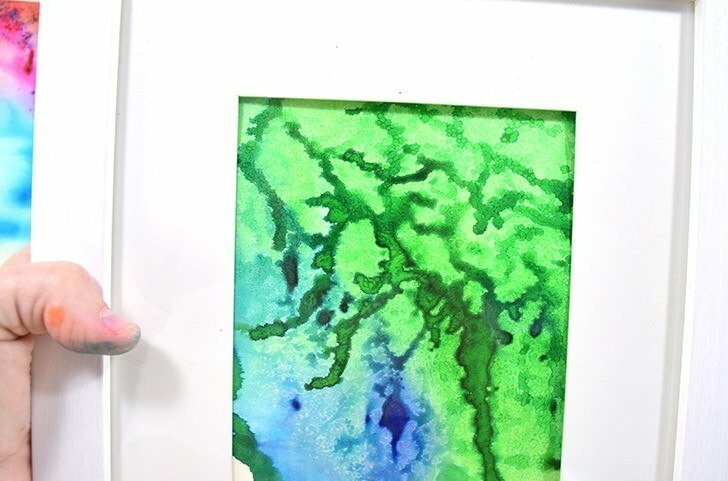 Want to learn how to make some really GOOD abstract art using food coloring and vegetable oil? 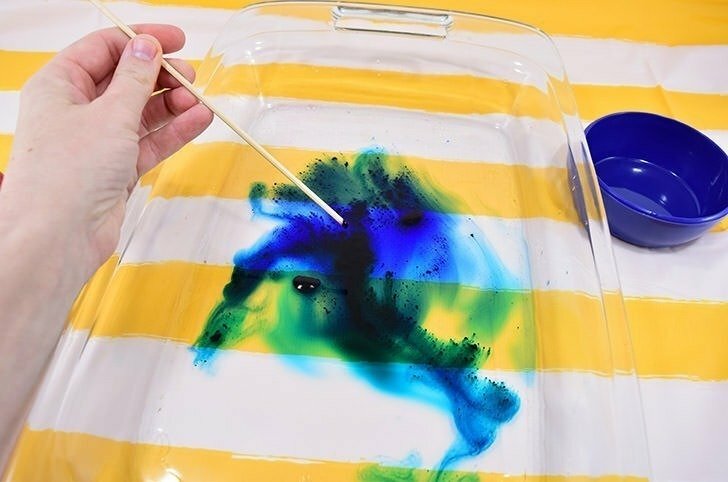 Yep, food coloring and vegetable oil! I wanted to make this project as accessible as possible, digging things out of the kitchen to use. 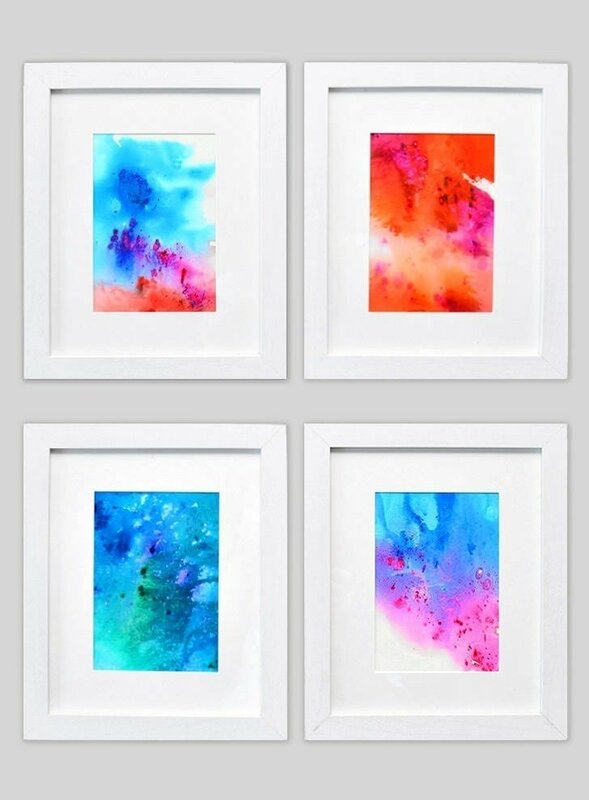 Instead of purchasing a set of watercolors (which you could also do) I decided to use food colors. 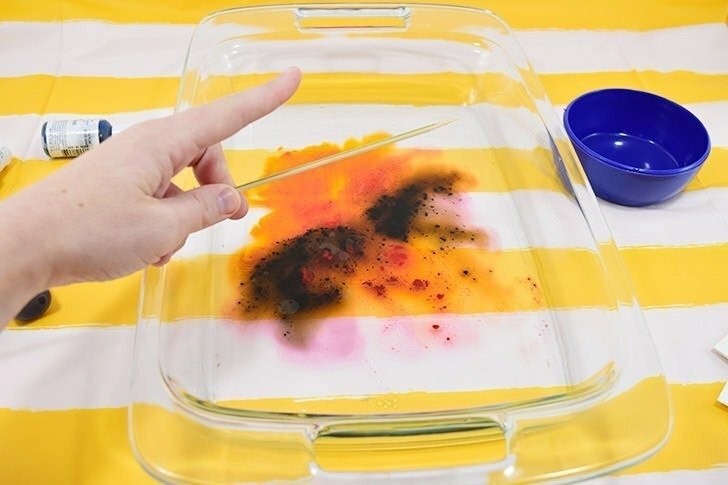 GEL food colors are going to give you these amazing, vibrant colors you’re seeing in my art so be sure you use them rather than the traditional liquid food colors. I purchased this set, on July 8, 2015 and I’m STILL using it, even with using it for both crafts and food. So if you’re looking for a set with lots of colors (this has 12) that will last you for AGES, this is the ticket. 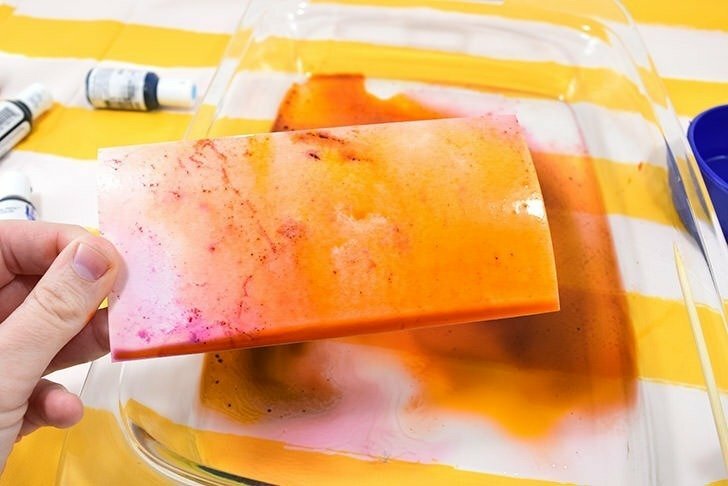 Liquid food colors don’t work simply because they aren’t concentrated enough. The liquid quickly disperses through our water turning it a single color, so you don’t get these multiple colors and shades in a single piece like in the 2 paintings you can see above. 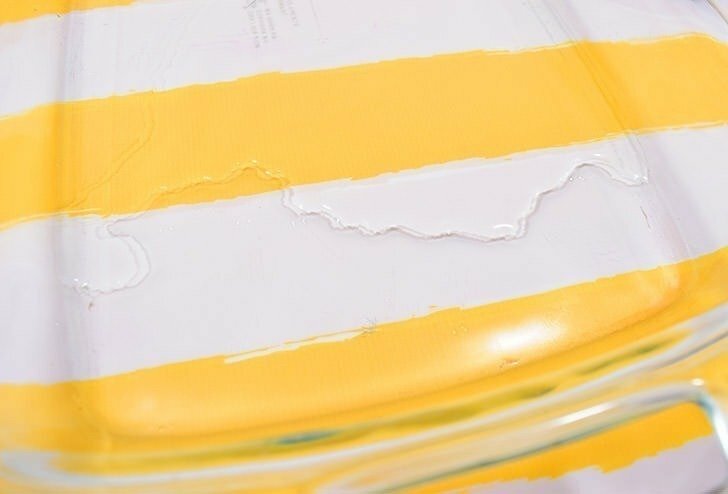 For this project to work well, you need just a trace of water in a very shallow dish. Like, not even enough water to fill the entire bottom of it. Just splash 2-3 tablespoons, max in a big casserole dish sized pan. Oh, and you don’t have to use any special kind of water. Keep the distilled for drinking and pull right from the tap. I have BAD city water, so gross, like we don’t even give it to our pets because the vet said it’s why they were constantly getting UTI infections, and it worked really well. Yay! 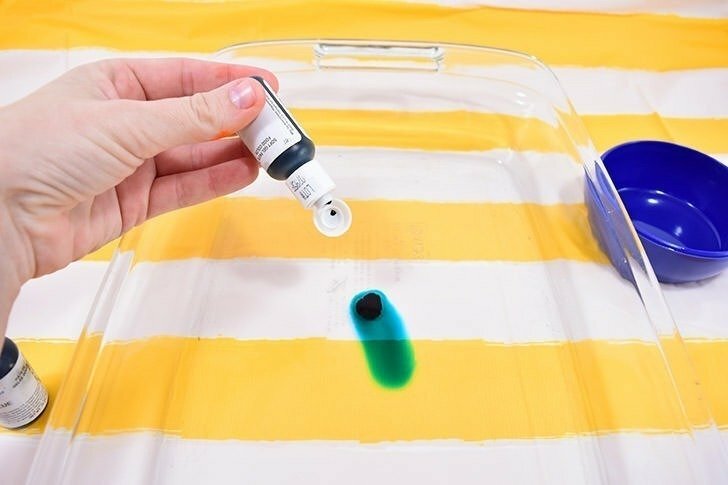 In your water place drops of gel food coloring in colors that work well together. 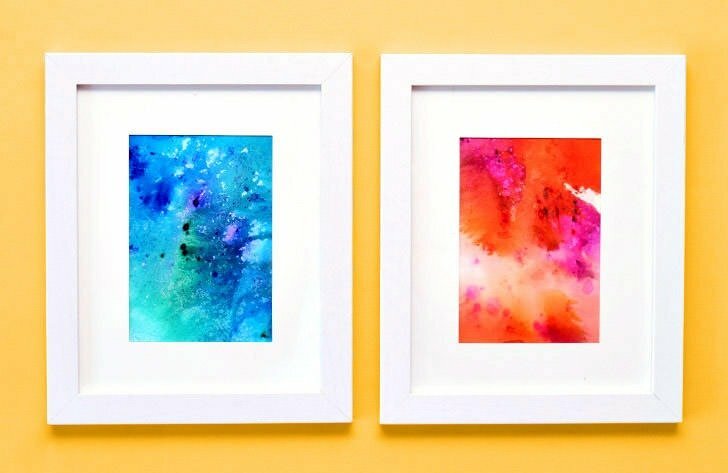 Though orange and blue work well together for most things because they are complementary but when mixed together they make BROWN, so select colors that will BLEND well because they will run together at least a little. 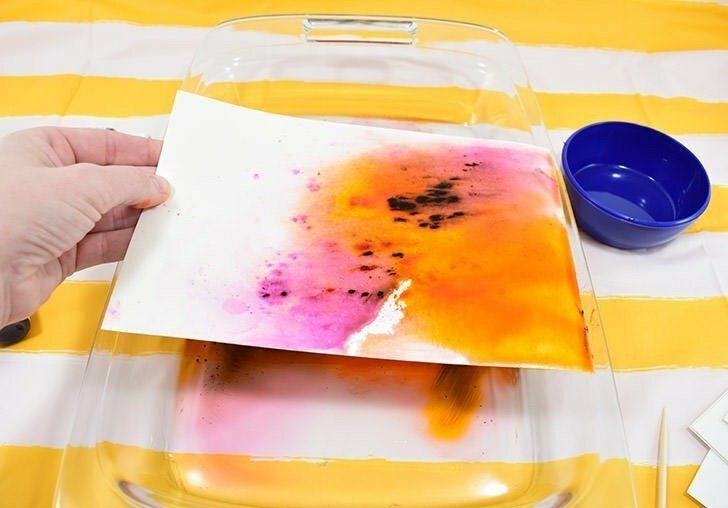 There are 2 options to add vegetable oil to your water to create some interesting resist patterns. You can do 1 or 2 sprays of pump oil on top (see how the water is running away from the oil with those neat striations forming? FYI – this is Pam Canola Cooking Spray I buy at the grocery store. Click the link over here if you want to see info about the product but buy it at your local grocery because it’s loads cheaper. 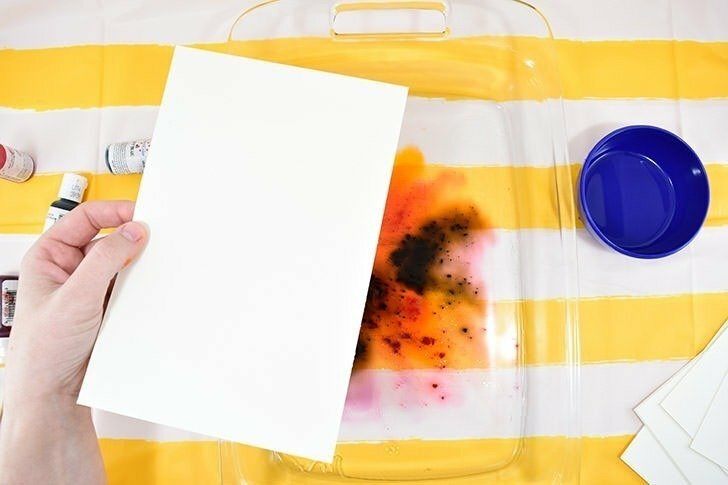 Using this spray method will disperse the color further for art with more color and less white space. Now, this is what came back from my paper as I pulled it out of the colored water and canola oil. You can see the speckles of oil spray on the surface of the paper as pink dots. When I pulled this out of the water I was seriously all, meh. 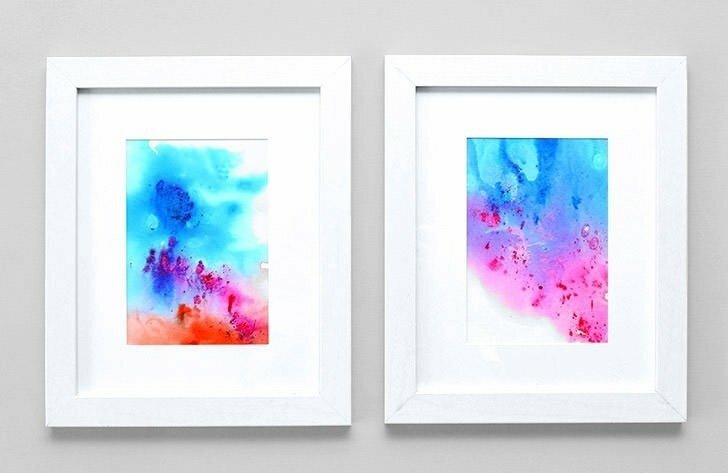 But as the colors dried, they bled a bit and the color expanded and those areas where the paper took on more oil became pink. The end result was this painting. Cool, right? 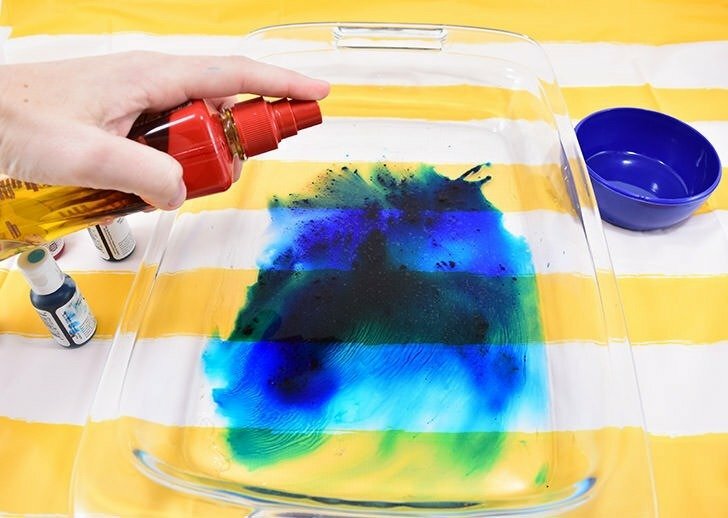 If you don’t have spray or if you have heavy-handed children getting in on this action, you can also pour a small amount of vegetable oil in a small bowl and have them flick the oil on top of the water’s surface by tapping the stick down toward the water. See those dots of darker color? Those are areas of the gel coloring that haven’t dispersed much and are really concentrated. These can occur naturally in the water, but you can also encourage them by dipping your toothpick or skewer into the puddles of gel and moving bits of it around. To get more white space and less color, add your colors but don’t stir them around. Allow them to sit for a few moments and naturally blend with the water around them. To create the dark speckles of color. But how do you actually transfer these designs onto paper? 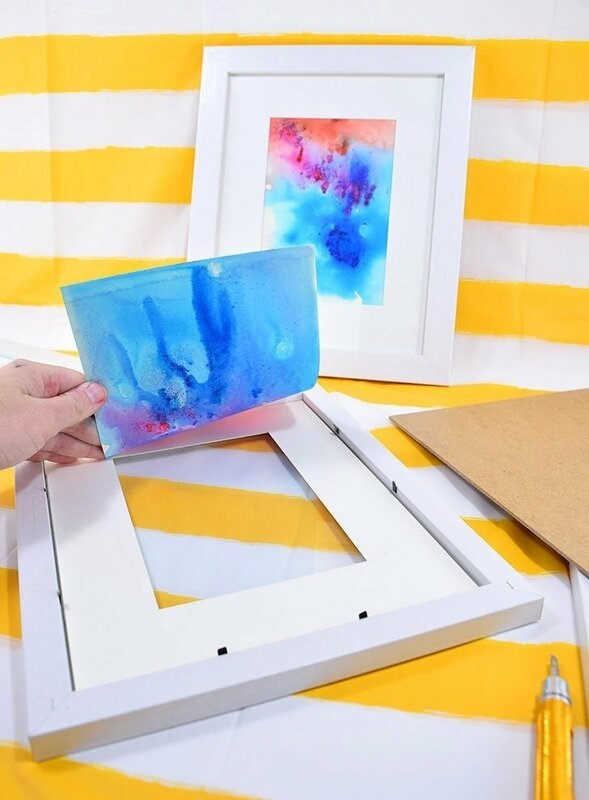 Take your watercolor paper, cut to fit within your dish of water and colors and place it STRAIGHT DOWN into the mix. If you want less white space, you can dip areas that didn’t get any color into the mix again. 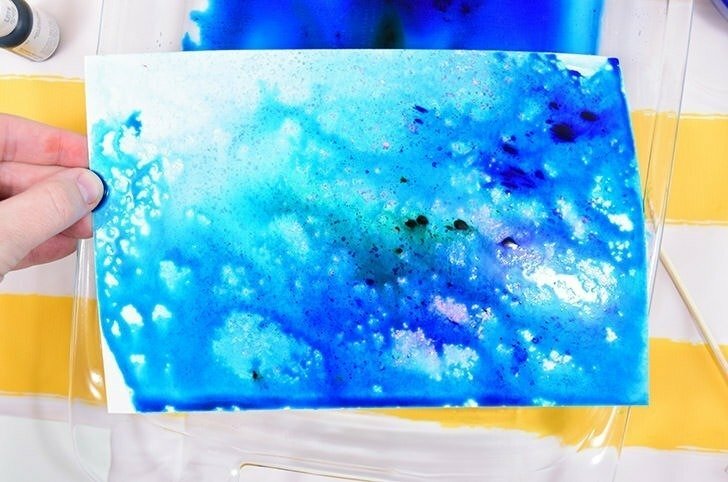 Unfortunately, after putting the paper in the water and removing it, you will have stirred business up and muddied the colors a bit. This is on a third dip, just to show you. This guy dried to look like nothing but pink on one side and orange on the other. Totally unspectacular. That, unfortunately, means lots of clean up between paintings, but since we’re using so little water, you can pour it into a nearby bowl and use a paper towel to soak up the trace left behind. It’s kind of amazing the results you’ll get with this method. 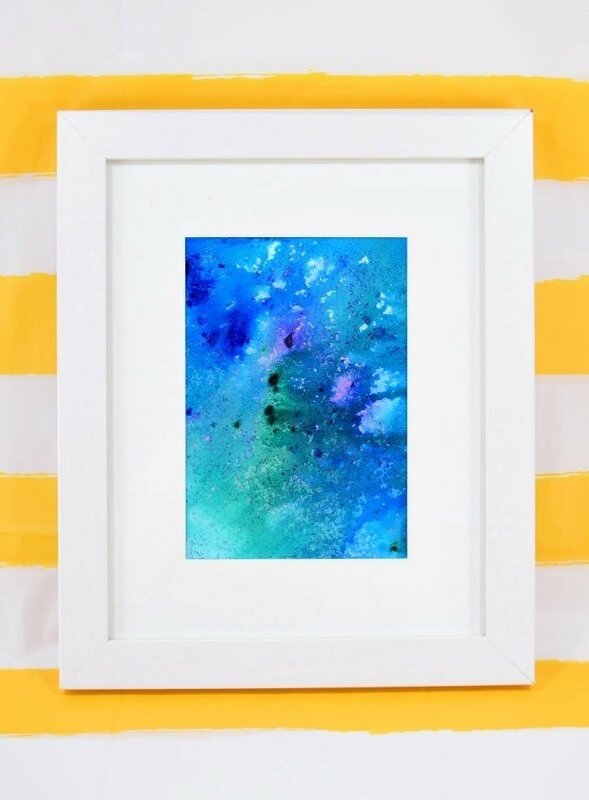 Each painting is totally unique and completely abstract. This is using canola spray a bit more heavy-handed using 3 pumps rather than 1 or 2. See how the color formed cells? About half of my paintings with more oil “turned out” and about half were nightmares. But that’s what is so neat about this art project, you never know what you’ll get until you come back and see the dried pieces! If you’re happy with the colors, as is, once dry you can frame them as you please. 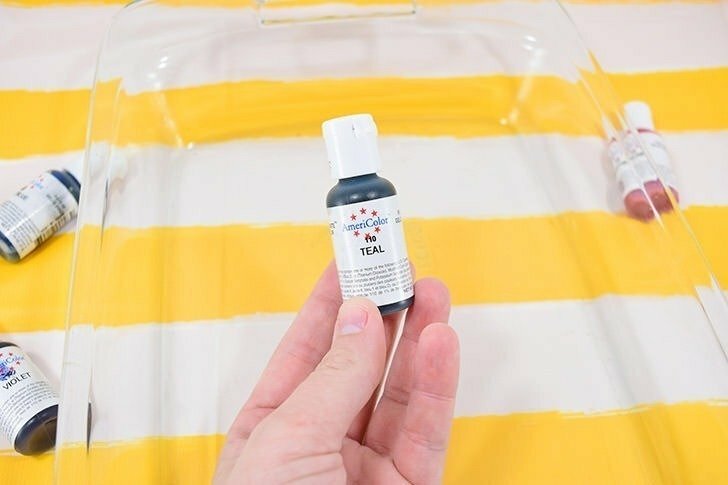 If you want colors that are brighter with more contrast and saturation, give the paintings a spray of top coat like a glossy clear acrylic spray or a polyurethane to make everything really POP. As always, it’s a good idea to test your particular spray with your particular watercolor paper to ensure it just enhances what is there instead of messing it up. I used Mod Podge Glossy spray and had no issues, but a tester is always a good idea if you don’t want to mess anything up.